So you've seen the Youtube videos and maybe caught a glimpse of those amazing dogs on TV at the Incredible Dog Challenge, and thought ... "Man! Wouldn't it be neat if I could get Spot to do that !!!" Well that's what I thought anyway and I didn't even have a DOG back then. Little did I know that would all change one day when I got Bandit. In fact, I had completely forgotten about Frisbee dogs and was just looking for a good dog for my wife and myself. I've learned a boatload about dogs and thought this might be a good time to share some of that knowledge with anyone who might be looking for a dog or who wants to get their dog into playing Frisbee. 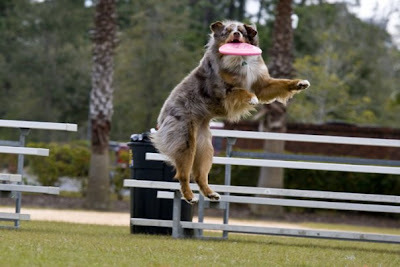 First and foremost, it should be mentioned that ANY dog can be a great Frisbee dog. Many of the dogs that win National championships in all of the competitive formats are from shelters just like the one in your community. Many of them end up there because they have too much energy or are too hyper for their owners to handle. This is exactly the type of characteristic that can turn a rescue into a superstar. Every dog has a superstar in him ... some just don't need to be coaxed into showing it. What most people do not realize when they have this type of dog is that with just a little time and energy on their part they can give their dog the job he needs so when it's time for ‘down time’ in the house, he'll be good and he'll know when to turn it on for a performance. By teaching your dog that the Frisbee is it's job, he'll have a sense of purpose in the pack and be a much better behaved dog because of it. I have also found that Frisbee dog training helps me when I'm having a tough day. My dogs and I work hard and focus on the task at hand, and this in turn means I am not focusing on whatever brought me down in the first place. Thanks for joining me in this little introduction to Frisbee training. Join me next time for a few tips on picking your own potential disc dog. Like this post? Click the envelope icon at the bottom and you can send it to your friends through email. Tanner wants to know if you give private lessons. His mom throws like a girl! Really good point you make that the most hyper dogs in rescue homes often make the best competitors. This is definitely true with Jack Russells. People don't know how to train and control them and think they're "bad dogs," but with the right training they have huge potential.